CATBALOGAN CITY, Philippines, May 3, 2017 — Exactly thirty years after a group of Italian cavers found in the province of Samar the country’s largest cave, another group of foreign cavers discovered this April the “longest cave” in the Philippines. The Sulpan cave system in the mountain town of Matuguinao in Samar province, according to the cavers, is now the new record holder as the country’s longest cave after it surpassed by about a hundred meters the cave in Palawan that was the previous record holder (32 kilometers long) while the cave in Samar is 32.100 kilometers, Matteo Rivadossi, team leader of the 2017 Samar international caving and cave diving expedition, claimed. Rivadossi said the cavers had a hard time exploring the Sulpan cave system, particularly during the last leg of their expansion expedition. “This is incredible. We have surveyed many, many little passages — crawling and diving, So, (it was) not easy,” he said in an interview with this writer on April 30, the day before their group left Catbalogan for Manila where they will took a flight back to Italy and Slovenia. Rivadossi said the new record holder as the longest cave in the Philippines is composed of Sulpan Cave, which was connected to the Sulpan Barruz system in 2011, in Barangay (village) Barruz and the Sulpan Male-ho Cave, located near the nearby upstream village of Camonoan. “So, now the system is e-ho and Sulpan Cave and Sulpan Barruz,” he said. He disclosed that another cave, the Tres Marias Cave, is connected to the system, and that their last discovery was Libon Cave, “an enchanted place, a lake” that is a window into an underground river. 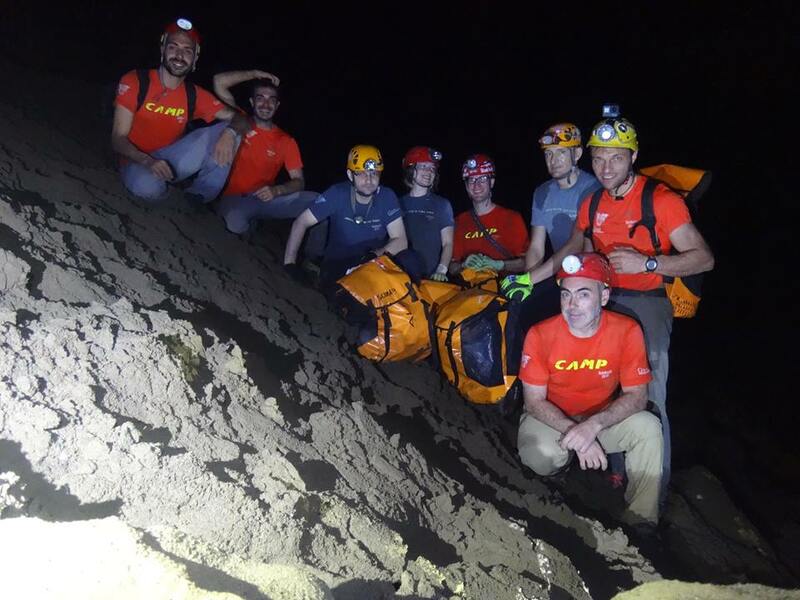 Aside from Italian caver Rivadossi (team leader), the other members of this year’s international expedition 2017 in Matuguinao were Italian cavers Guido Rossi (geologist), Antonio Cortina (geologist), Davide Merigo, Stefano Panizzon and Maurizio Reboldi; Slovenian cavers Simon Burja (diver), Matjaz Bozic, Katarina Seme and Marjan Vilhar; and Samar caver Joni Bonifacio (local guide) of the Philippines. The 2017 Samar caving and cave diving expedition was organized by Odissea Naturavventura in partnership with Gruppo Grotte Brescia “Corrado Allegretti” of Italy. The cavers’ group also expressed thanks to CAMP, Montura, Alp Design, Amphibious, Alpstation. Brescia, Universat Italia, Roditor National, Adriano Cordini and Lorenzo Caramazza for their support to the caving expedition. In 1995, a team of French cavers discovered the Sulpan Barruz System that is located in Barangay Barruz of Matuguinao, Samar. The cavers were then able to explore about 40 meters of the cave before they encountered a sump, or a submerged cave passage. But in 2011, a group of French and Italian spelunkers together with some cave divers, was able to connect through cave diving the Sulpan Barruz System to nearby Sulpan Cave, located also in Barangay Barruz that they also discovered that same year. The Italian cavers returned to Samar the following year and during their 2012 expedition, they were able to fully explore Sulpan Cave’s dry section. The total length of the dry section of the Sulpan Barruz Cave system was then about 11.2 kilometers. In 2015, they came back again but their divers failed to connect the already survered portion of the Sulpan Barruz Cave System to nearby Sulpan Male-ho Cave, which the French cavers first explored in 1995, and was explored and surveyed by Italian and French cavers during cave expeditions in 2011, 2012 and 2015. Rossi, a native of Verano in Italy, has been exploring caves in the Philippines for years now. He first joined a cave exploration in the Sagada area two years prior to coming to Samar in April of 1987 as one of the Italian speleologists who first surveyed and discovered the Langun-Gobingob Cave in Calbiga, Samar – the country’s largest cave. The team of Italian cavers was the first to explore, survey and map the Calbiga cave system in 1987. The cave system covers an area of 2,968 hectares and is the largest karst in the country and said to be the second largest in East Asia. It has 12 caves, including Gobingob, Langun and Bitong Mahangin that boast of giant columns, stalactites and stalagmites as well as unique rock formations, underground water courses and springs. Langun, the main cave, has a chamber that is 270 meters long and 160 meters wide at its largest area, according to the speleologists. This means that a football field could easily fit into the area. On the other hand, the Gobingob Cave has a huge hall with beautiful stalagmite, stalactite and flewstone formations. As a protected area, the Calbiga caves complex houses rare species like blind crabs and the 7-centimeter hypogean blind fish. The cave system also has a “truly exceptional hydrogeological karst,” swallowing more than 20 watercourses. Later expeditions further lengthened the cave system with the help of cave divers. For instance, they discovered the 6-kilometer Camparina-Ludi Bito-Burabot Cave that has many branches, and the Lurodpon Cave, a submerged cave passage. Marcel Paul, leader of the French caving team that included his wife Catherine, said that they have again explored this April the Maoyog Cave, which he calls his “6-year-old baby.” The last time the Paul couple went caving in Samar was in 2015. Paul added that they entered one of the caves for almost a kilometer and saw beautiful galleries until they reached a sump. “Maybe the next target is for a French-Italian Expedition because there is a big sump there (that cave divers could explore),” he said. He, however, did not say exactly when he will be come back to Samar Island. “There are so many things to discover,” he said referring to the caves in Samar Island. Paul also said the people in Samar are friendly and they also cried when we left the place. Geologists Rossi and Cortina as well as team leader Rivadossi of the Matuguinao cave expedition shared Paul’s observation that aside from having beautiful caves, Samar also has people who are hospitable, helpful and friendly.